The pear and its origins can be traced back to about three thousand years ago when they were first discovered in western Asia. Pears have been revered throughout time and they were called the “gift of the gods” by Homer in his epic, The Odyssey. These delectable fruits were a luxury in the court of Louis XIV. Pears are delicious fruits that are related to the apple and the quince. There are thousands of varieties of pears with each differing in size, shape, colour, taste and storage qualities. In Canada, the Bosc, Bartlett, Anjou and Comice pears are the most commonly available varieties. Pears generally have a large round bottom that tapers towards the top. Depending upon the variety, their paper-thin skins can either be yellow, green, brown, red or a combination of two or more of these colours. The white to cream-coloured flesh of a pear is very juicy and sweet, while the texture is soft and buttery, yet slightly grainy. Like apples, pears have a core that has several seeds. Pears are a good source of fiber which helps to promote regularity. Fiber has also been shown in a number of studies to lower high cholesterol levels which is good news to people at risk for atherosclerosis or diabetic heart disease. Fiber in the colon binds to bile salts and carries them out of the body. Since bile salts are made from cholesterol, the body must break down more cholesterol to make more bile, a substance that is also necessary for digestion. The end result is a lowering of cholesterol levels. 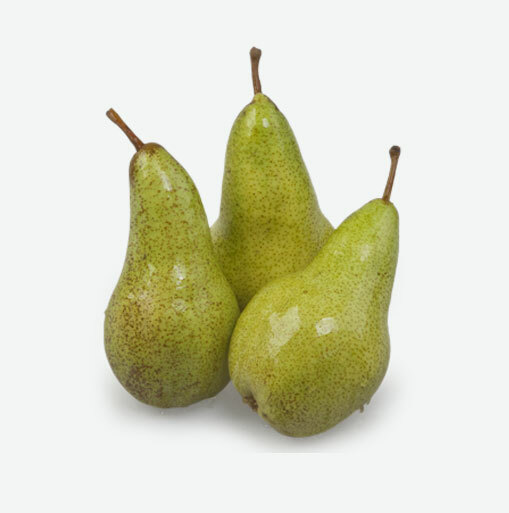 Pears are considered to be a hypo-allergenic fruit. Pears are often recommended by healthcare practitioners as a hypoallergenic fruit that is less likely to produce an adverse response than other fruits. Particularly in the introduction of first fruits to infants, the pear is often recommended as a safe way to start. Pears are a good source of dietary fiber, vitamin C, copper, and vitamin K.
The pears you find at the market will generally be unripe and will require a few days of maturing. Look for pears that are firm, but not too hard. They should have a smooth skin that is free of bruises or mold. The colour of good quality pears may not be uniform as some may feature russetting where there are brown-speckled patches on the skin; this is an acceptable characteristic and oftentimes reflects a more intense flavour. Avoid pears that are punctured or have dark soft spots. Pears need to be left at room temperature in order to ripen. Once their skin yields to gentle pressure, they are ripe and ready to be eaten. If you don’t plan on eating the ripe pears immediately, you can place them in the refrigerator where they will remain fresh for a couple of days. Remember to store your pears away from other strong smelling foods, whether on the countertop on in the refrigerator, as they tend to absorb smells. Fresh pears are delicious eaten as is after gently washing their skin by running the fruit under cool water and patting the fruit dry. Since their skin provides some of their fiber, it is best to not peel the fruit but eat the entire pear. To cut the pear into pieces, you can use an apple corer, cutting from the fruit’s base to remove the core, and then cutting it into the desired sizes and shapes. Once cut, pears will oxidize quickly and turn a brownish colour. You can help to prevent this by applying some lemon, lime or orange juice to the flesh. Try mixing pears with mustard greens, watercress, thinly sliced red onions and almonds or walnuts for a delicious salad. Serve pears with goat or bleu cheese for a delightful dessert. Add chopped pears, grated ginger and honey to your porridge for a nutritious and sweet breakfast treat. Core pears, and poach them in apple juice or wine with a sprinkle of cinnamon.